Many Dads rely on paternity DNA testing as the most accurate and accepted method of determining biological relationships within the legal and scientific communities today. Paternity Testing is the most accurate method of establishing fatherhood available today. Because everyone on the planet is born with a unique genetic blueprint known as Deoxyribo Nucleic Acid or simply DNA, the molecular structure and genetic characteristics of a child are inherited from or determined by the DNA structure of the biological mother and father, DNA identification provides a conclusive and definitive way to establish biological relationships and as a result, DNA testing has become the most accepted method to determine identity within both the legal and scientific communities today. There are several different types of DNA paternity tests available depending on where the results will be utilized. If the test results are going to be used in a court case there are specific procedures to be followed in order to ensure the results will be admissible in court. If the results are only to be used for peace of mind identification, an at-home-test were the samples are collected outside of a clinic are perfectly acceptable. Paternity tests used for legal cases require samples that are collected, identified and authenticated by a registered medical professional. 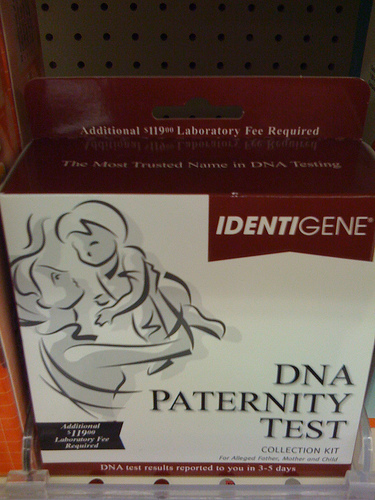 • When a man faces child support payments, as well as legal responsibility for a child in a paternity lawsuit, a paternity test will establish for certain what the relationship is between father and child. • When a person with a large and valuable estate dies there are often multiple claims for a portion of the inheritance. A DNA test will establish the actual blood line status of the claimants in a way that is indisputably fair to all involved. • When children are adopted early in life, they sometimes will want to locate their true biological parents after they become adults themselves. There can also be medical reason to determine a person’s biological parent or child, as in cases of organ donation that require specific matching. • When twins are involved, unless they are identical you can’t assume they have the same father without a DNA test to establish who their actual father is. Identical twins that do share the same father will have identical genetic codes. • Proof of paternity can also be required to settle certain social security and insurance claims by proving a biological relationship in court. The good news for Dads is that paternity DNA testing from an accredited laboratory will be accurate 99.9% of the time and legally recognized worldwide as the quickest and most accurate way to establish the exact biological relationships between people.